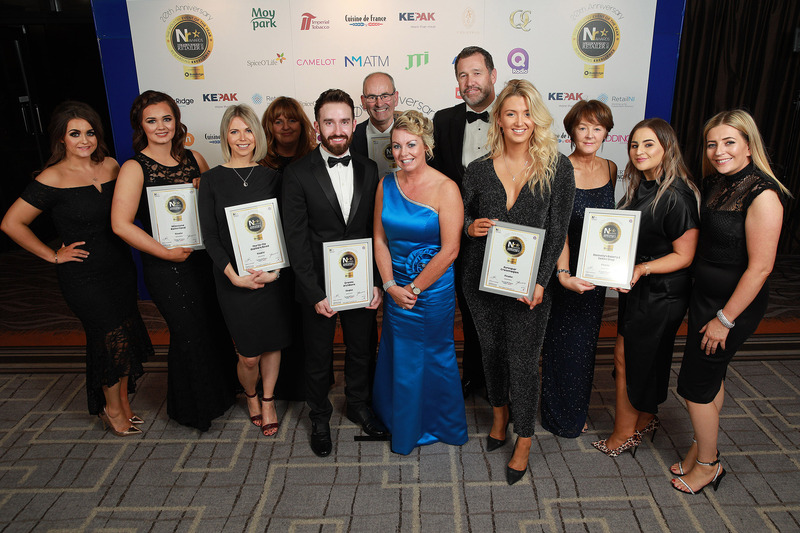 A sell-out crowd of over 500 of the industry’s most innovative figures gathered for the 20th annual Neighbourhood Retailer Awards sponsored by RiverRidge. 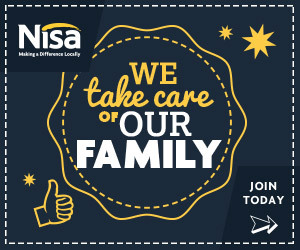 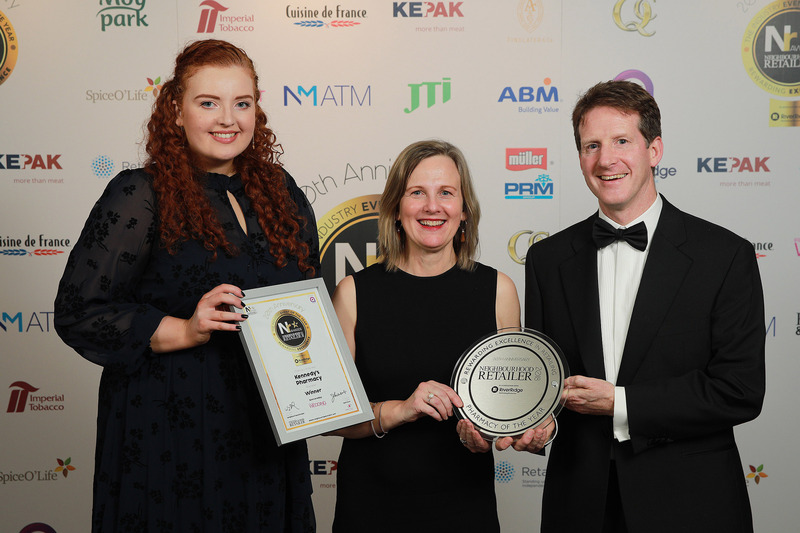 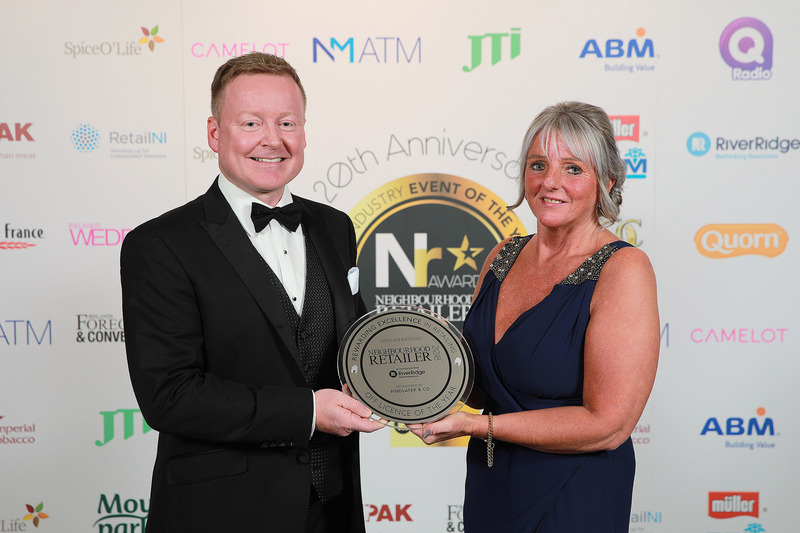 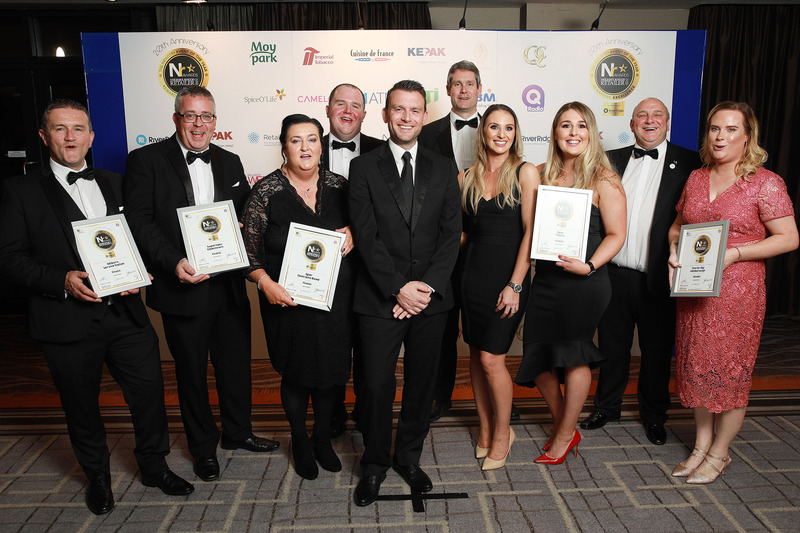 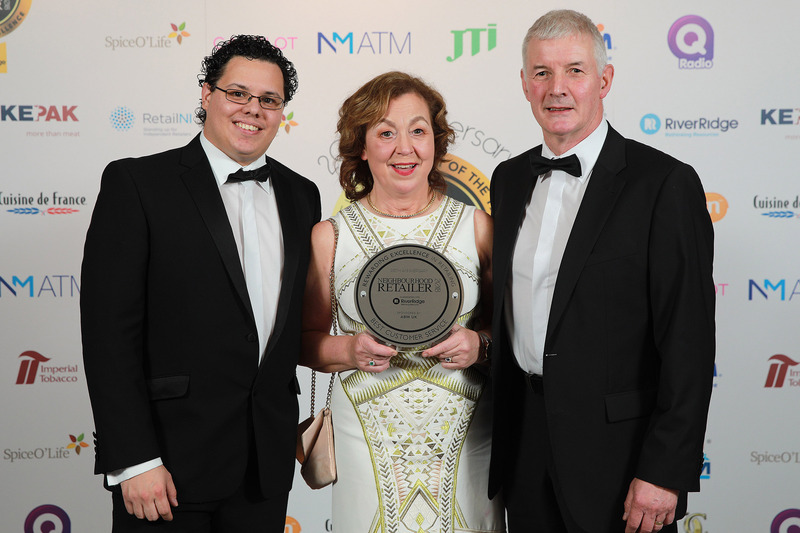 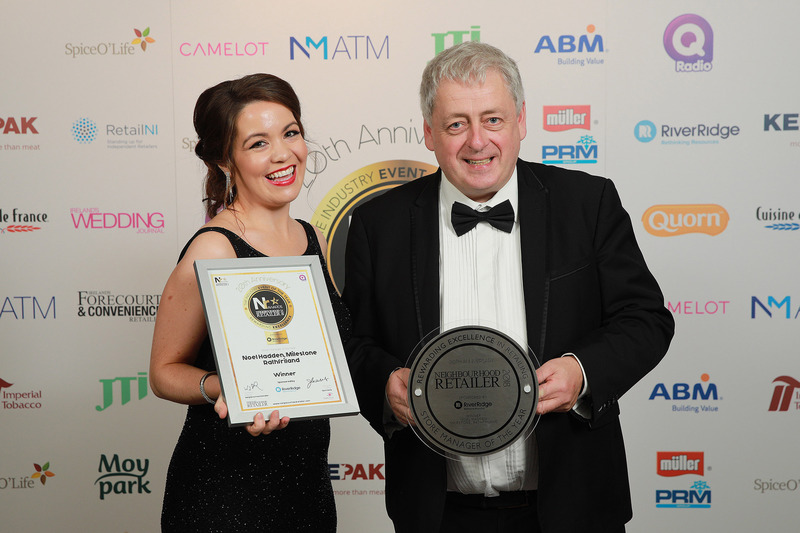 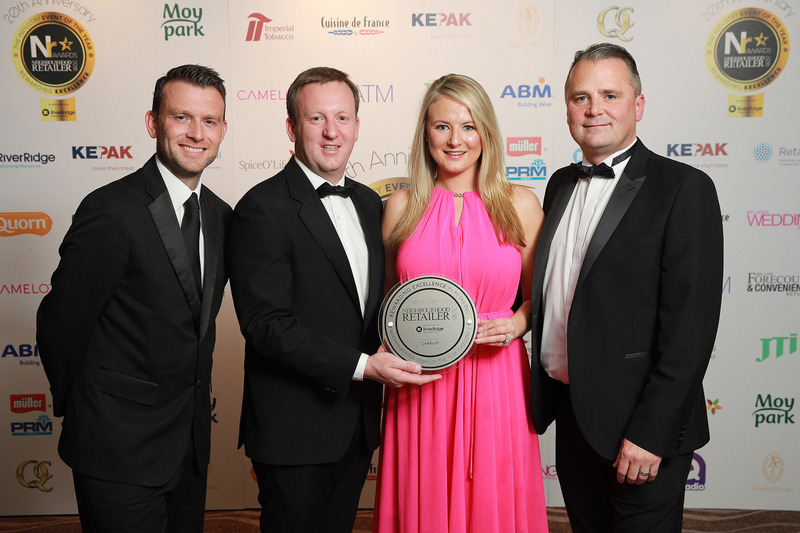 Milestone NisaExtra Rathfriland were the overall winners on the evening taking home gongs for Neighbourhood Store of the Year Category 4, Fresh Food Store of the Year, Store Manager of the Year, as well as the highly coveted Neighbourhood Retailer of the Year 2018. 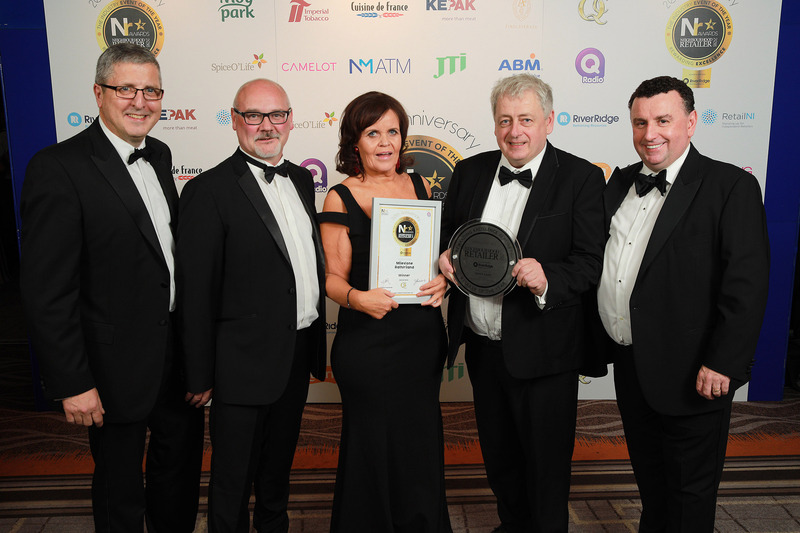 Paul Hoy (second left) of category sponsor Quick Cash is pictured with Retailer of the Year winners Ann and Tom McAvoy; (centre), Pat Leneghan (left), Head of Retail (Ireland) Nisa; and publisher of Neighbourhood Retailer, Bill Penton (right). 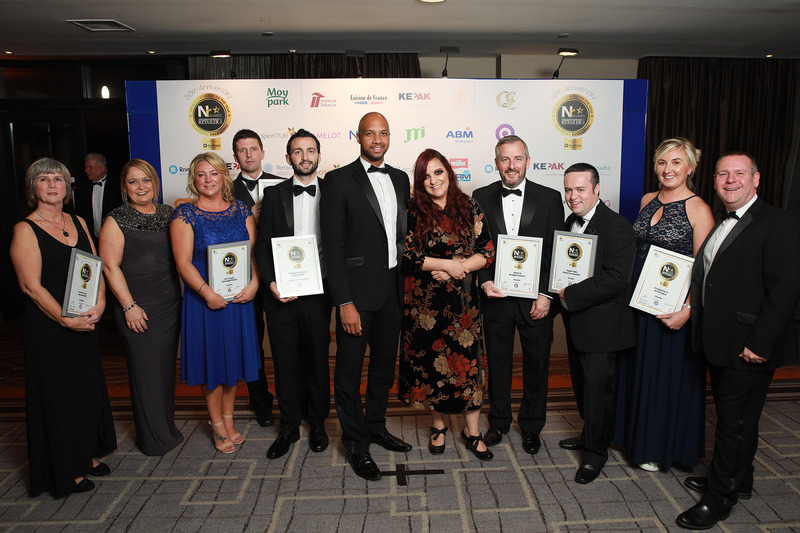 Terry, Adina and Mairead Mulkerns are pictured with Thomas Magennis (right); and Ibe Sesay and Yazz Zemmoura, of category sponsor Q Radio (back row). 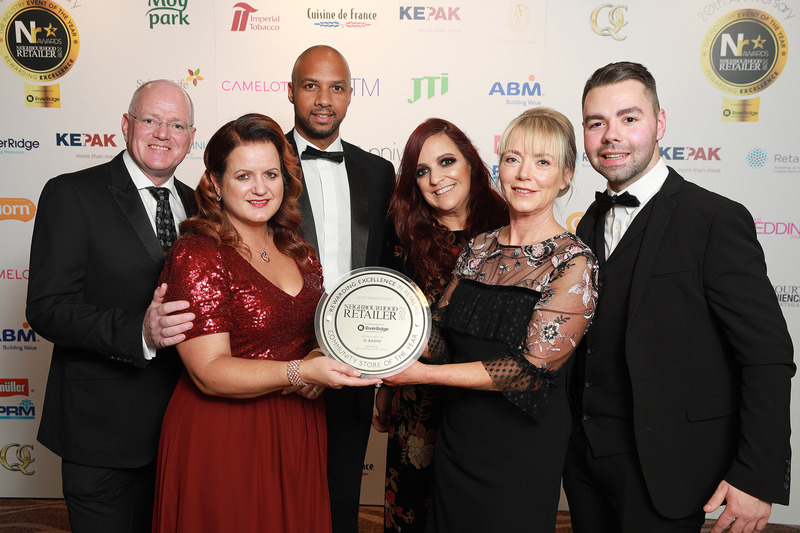 (L-R): Alison Strong, Hunters of Armagh; Jo Walker and Glenda Hanna, Eurospar Donegall Road; Jonathan Mitchell, Eurospar Cullybackey; Sean Boyle, Newell Stores Coalisland; Ibe Sasay and Yaz Zemoura, sponsors; Keith Tomlinson, Centra Draperstown; Darren Given, SuperValu Newtownbutler; Sue-Ellen Gorman and Alan Gilliland, Creightons of Finaghy. 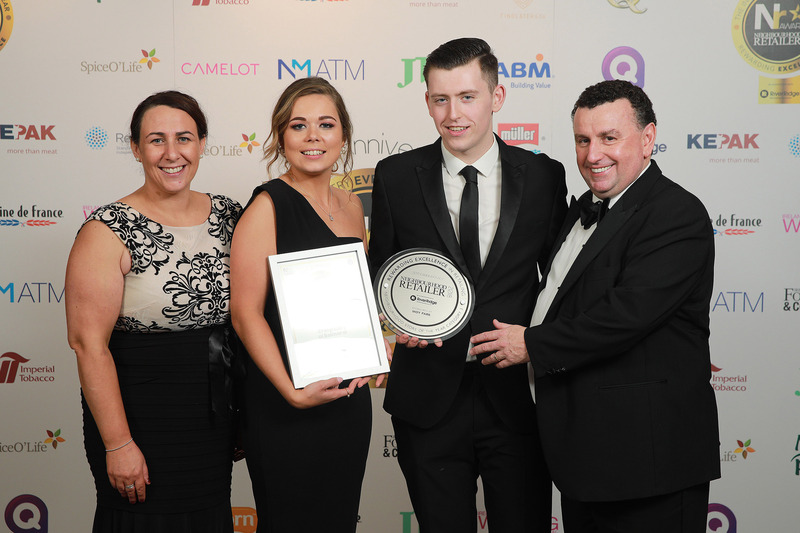 (L-R) William Owens; Cara Murphy, from category sponsor Müller; Sarah Snowden and Aidan Fisher from category sponsor PRM. 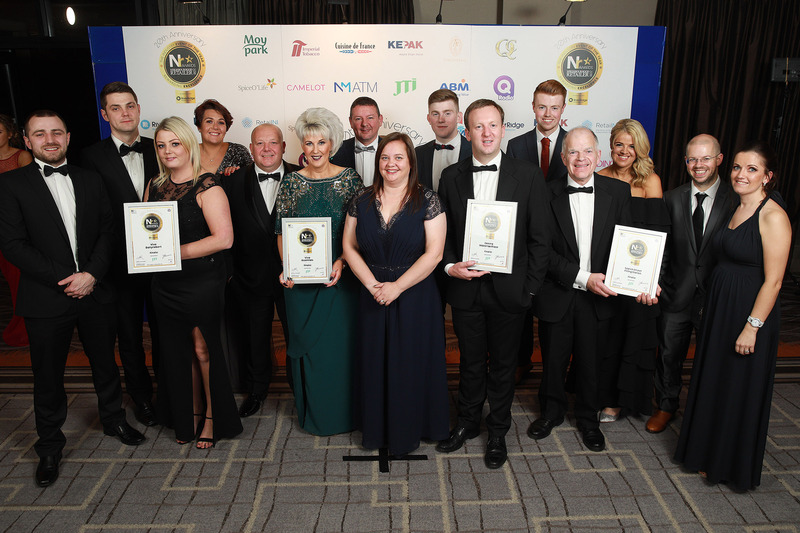 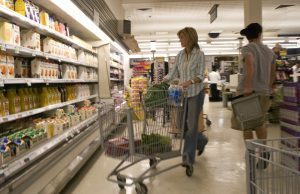 Finalists from Eurospar Maghera, Fulhan’s Foodhall, Hughes NisaExtra, JC Stewarts, McCool’s SuperValu Ballymoney, Nisalocal Cullybackey, and P&G Eurospar. 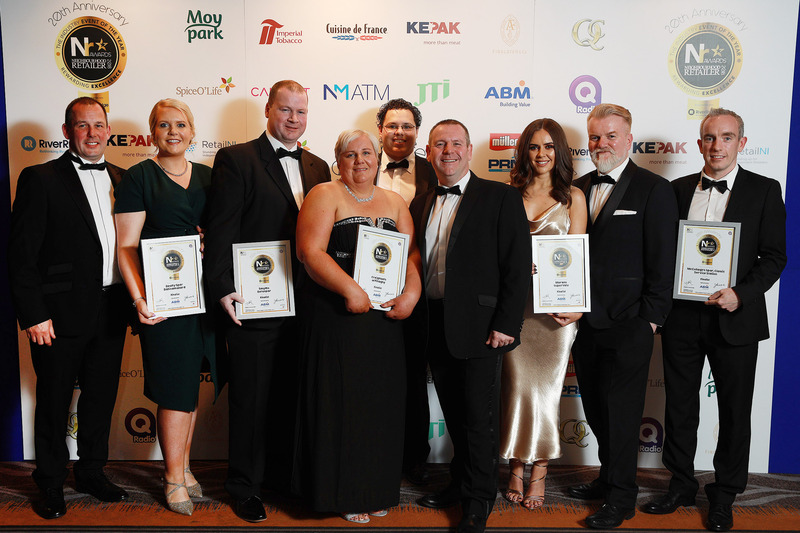 (L-R): Ciara Daly, Mace; Austin McGrath, Musgrave NI; Edel O’Connor; James Dunsmore, of category sponsor Note Machine; and Keith and Maura Dolan. 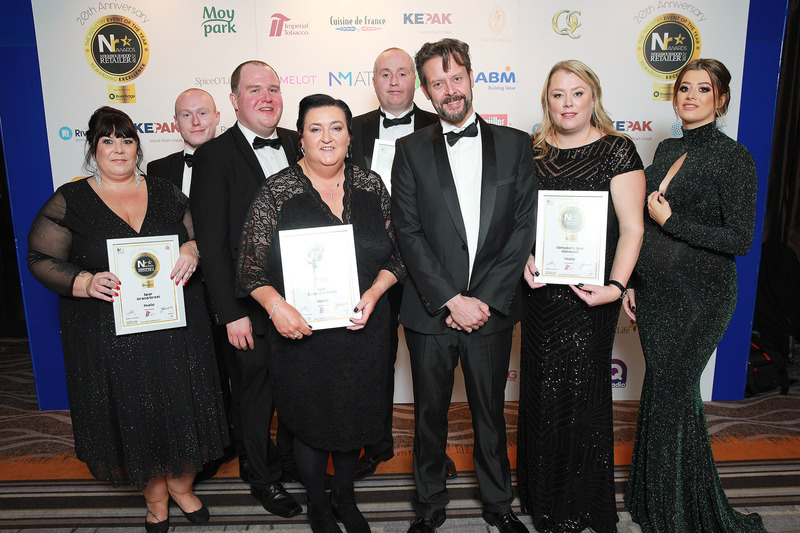 (L-R): Patrick and Julie McConville, Nisalocal Ardboe; Kevin and Bernadette Farrell, Derrygonnelly Spar; James Dunsmore, from category sponsor Note Machine; Paul Holder, Spar Letterbreen; John Cummings, Nisalocal Cullybackey and Philip Woods, Centra Circle K, Dobbin Road. 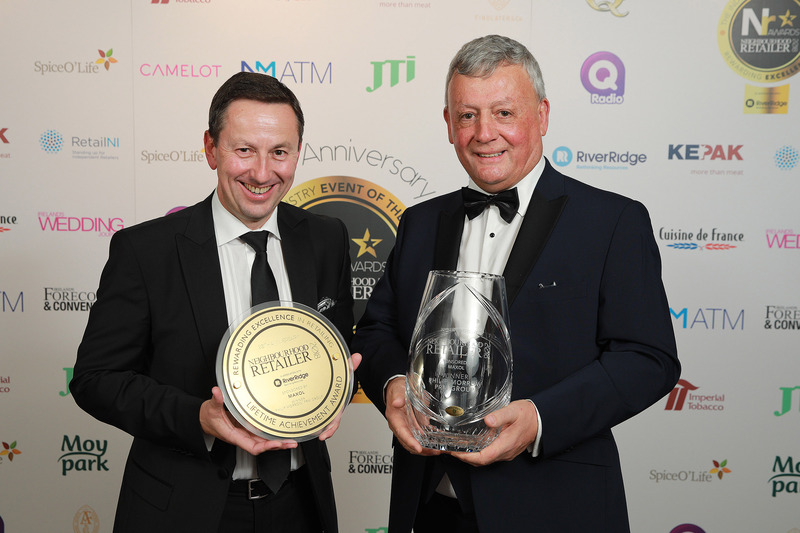 Marty Donnelly from category sponsor Spice O’ Life presenting Gary Baird from McAtamney’s Galgorm with his award. 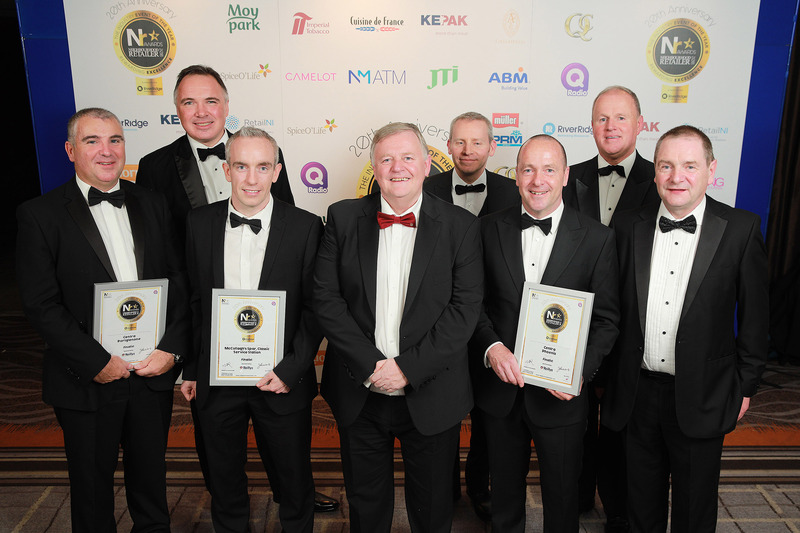 (L-R): Ryan Tosh and Fergal McKay, McKay Family Butchers; John Carnduff, H&J Carnduff; Chris McCormick, McAtamney’s Lisnagelvin; Marty Donnelly, from category sponsor Spice O’ Life; John Henderson, McAtamney’s Ballymena; Declan Robinson, McAtamney’s Irish Green Street and Chris Cunningham, Cunningham’s Butchers and Food Hall. 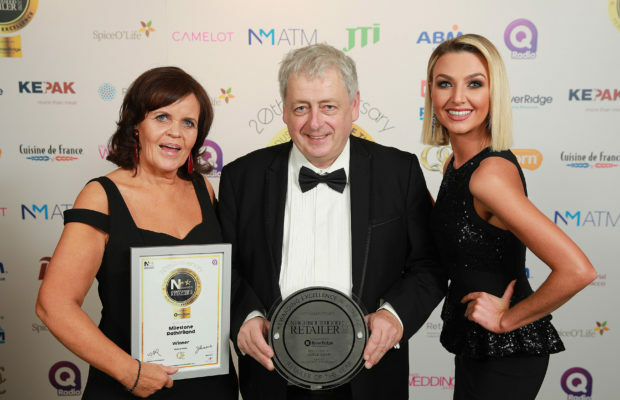 Owner of Milestone NisaExtra Rathfriland, Tom McAvoy accepts the award on behalf of store manager Noel Hadden from RiverRidge’s Bronagh Sproule. 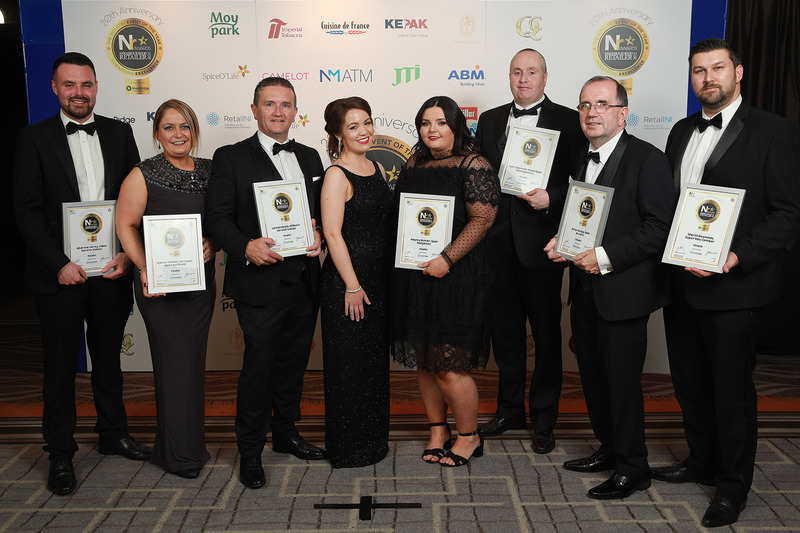 (L-R): Andrew Carey, Cable Service Station; Jo Walker, Eurospar Donegall Road; Lorcan Boyle, Milburn Service Station; Bronagh Sproule, from category sponsor RiverRidge; Hayley Hunter, Spar Ballybeen; Gerry Bennett, Maxol Spar Tannaghmore; Brian Quigg, Spar Bovally Limavady; and Martin Reynolds, SuperValu Comber. 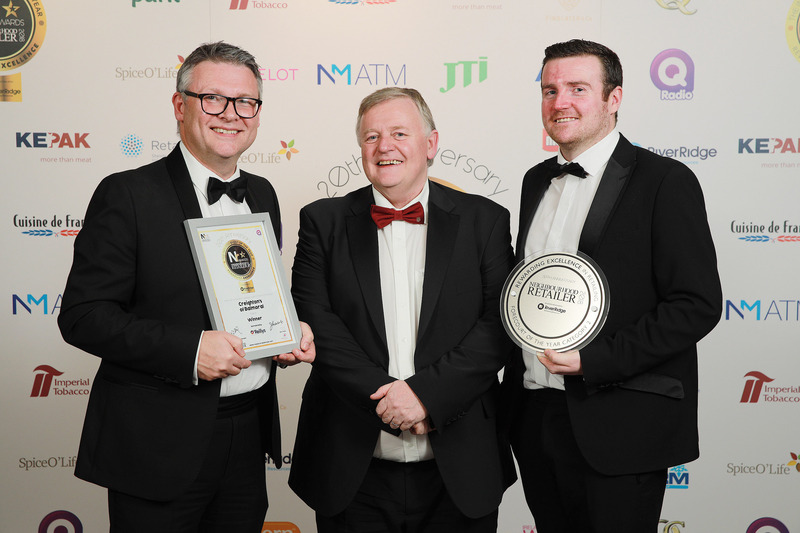 (L-R): Greg Deacon, from category sponsor Camelot; Noel Kavanagh and Siabhra Walsh, Centra Waterloo Place; and Austin McGrath, Musgrave NI. 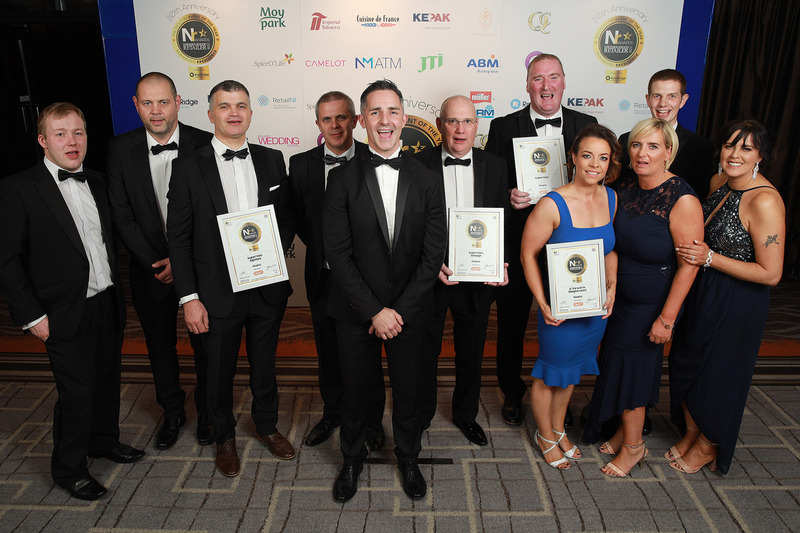 (L-R): Lorcan Boyle, Milburn Service Staton; Nicholas Mulholland, SuperValu Cookstown; Michelle Caskey and Cormack McGrath, Spar Maghera; Greg Deacon, from category sponsor Camelot; Kevin Finch, Milburn Service Station; Jenny Davis and Jade Goy, Spar Titanic; Paul Moorman and Emma Wray, The Co-Op Hillsborough. 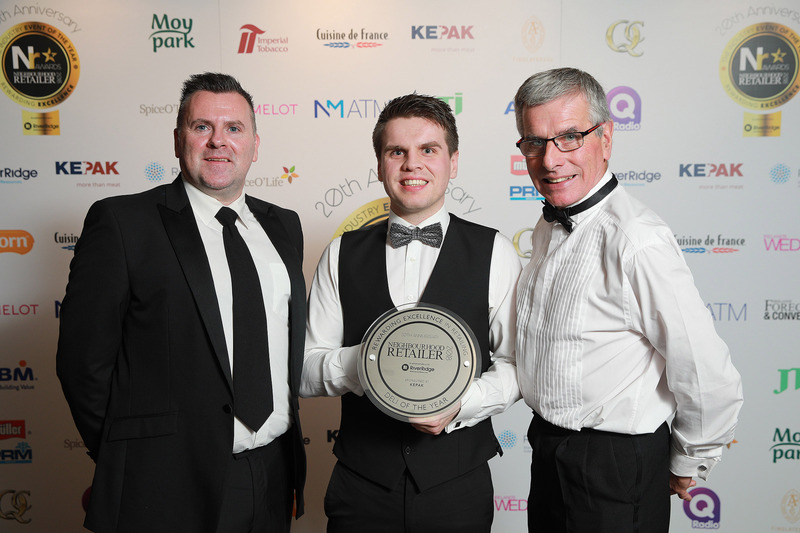 Aidan Flannagan, from category sponsor Kepak presents Christopher and James Cunningham with their award. 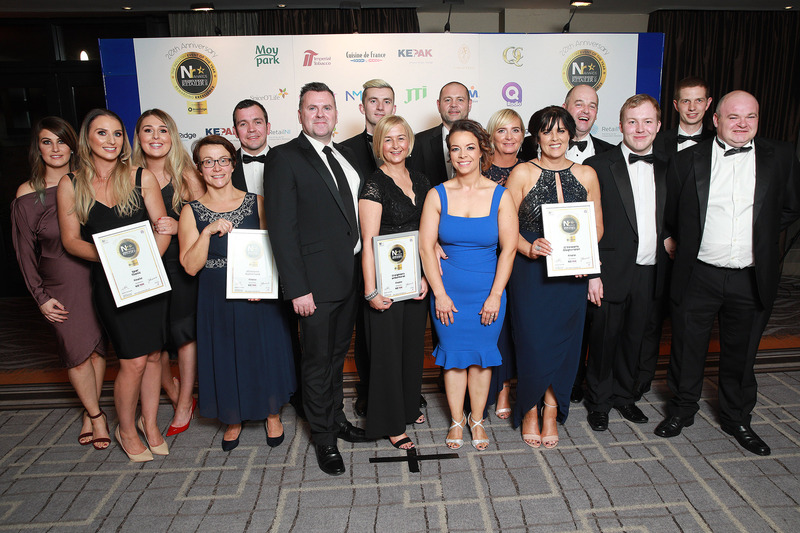 (L-R): Alison McDowell, Jenny Davis and Jade Foy, Spar Titanic; Bernie McKee and Cathal Grant, Milestone Rathfriland; Adrian Flanagan, sponsor; Paul Ansboro; Elaine Williams, Creighton’s of Balmoral; Beverly Atkinson, Pat Doherty, Sharon Newell, Karen Ledgewood; Pierce Kelly, Jordan Steadman, Gary McCullough and Sean Kelly, JC Stewarts Magherafelt. 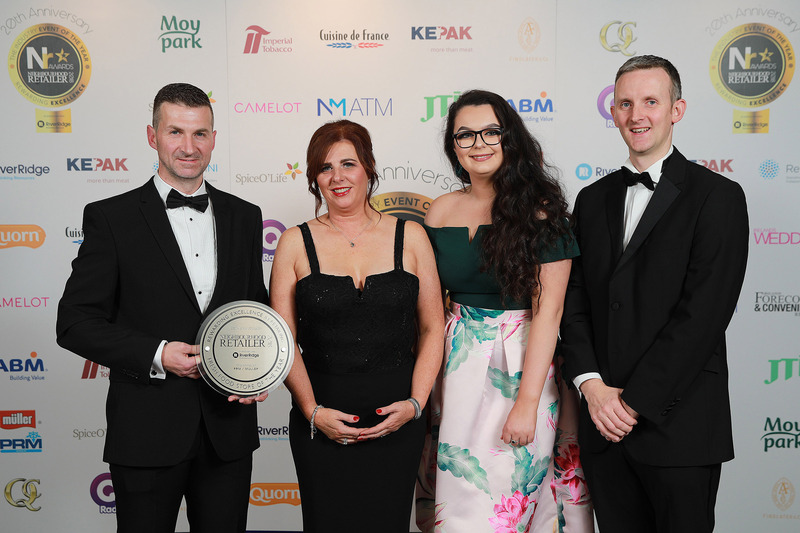 (L-R): Briege Finnegan of category sponsor Moy Park is pictured with Bronagh O’Hagan; Jack McCullough; and publisher of Neighbourhood Retailer, Bill Penton. 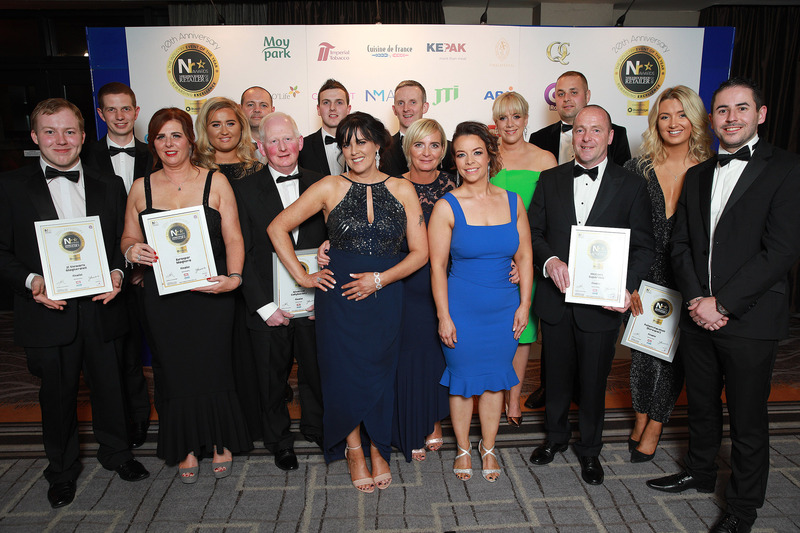 (L-R): Debbie McGall, Martin McLaughlin and Rachael Martin, McCools SuperValu Kells; Peter McCool and Kevin Killough, Centra Phoenix; Jonathan Mitchell, Eurospar Cullybackey (rear); Gillian Wilkinson, Kelly’s Eurospar Moneymore; Briege Finnegan, sponsor; Stephen McNeilly, Twelfth Milestone (rear); Judith Pitts, Kelly’s Eurospar Moneymore; Brian O’Neill (rear) and Ashlene O’Kane, O’Neill’s Nisaextra and Dwane Hegarty and Alan Gilliland, Creightons of Finaghy. 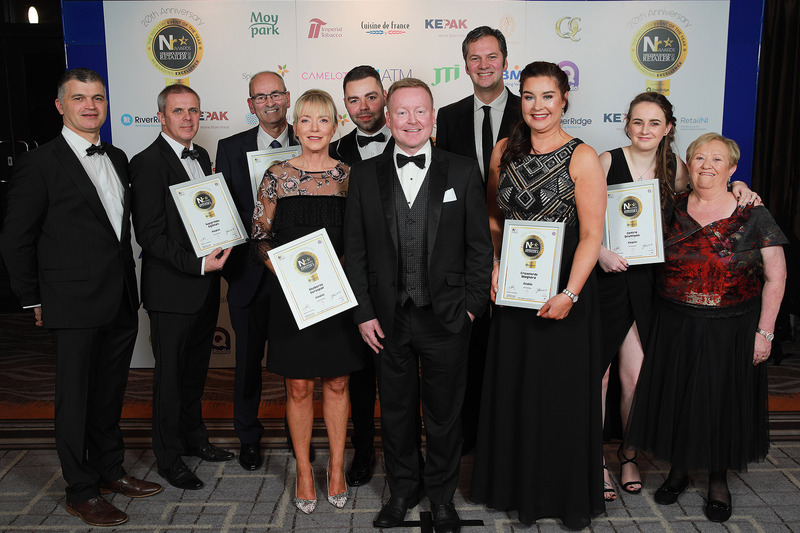 (L-R): Fiona Burns and Ben Rush, Spar Grand Street; Cormack McKay and Michelle Caskey, Spar Coleraine Road; Gerry Bennet, Maxol Spar Tanaghmore; David Atkinson, sponsor; Jean Patrick and Nicole Clayton, Campbell’s Spar. 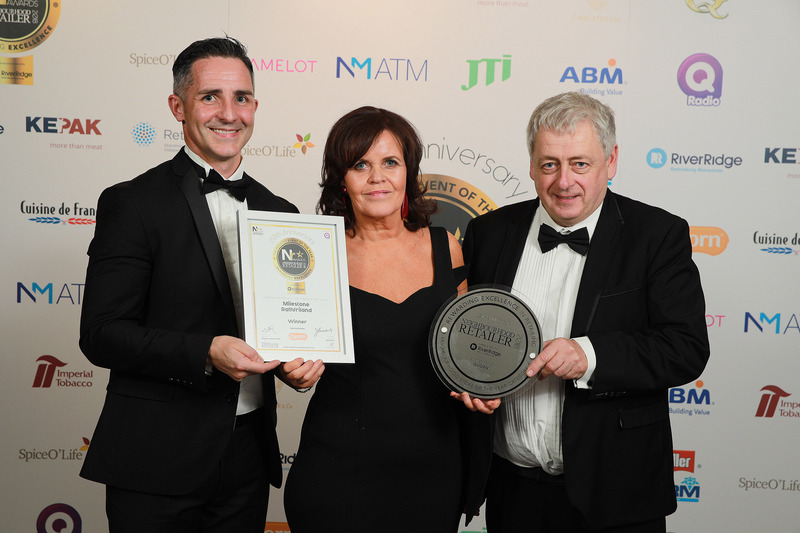 Glenn McCracken of category sponsor Quorn presents the award to with Ann and Tom McAvoy from Milestone NisaExtra Rathfriland. 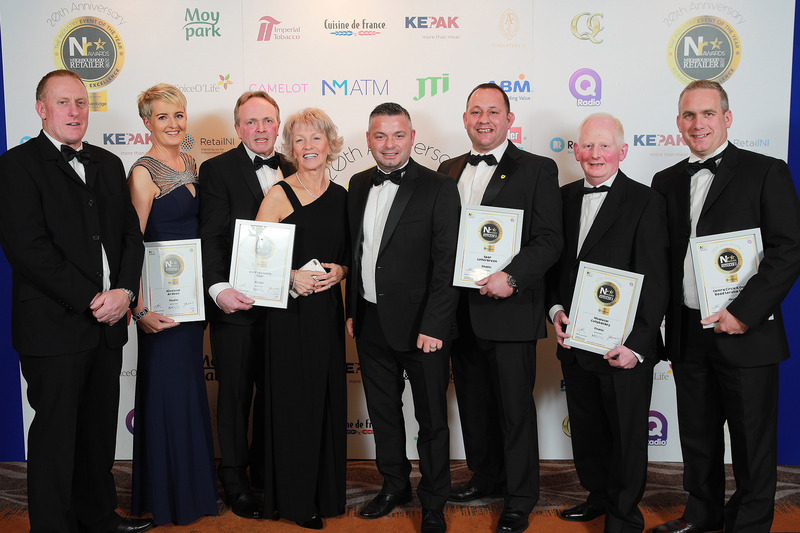 (L-R): Jonathan Steadman and Pat Doherty, JC Stewarts Maghera; Neill Cooke and Paul Millar, SuperValu Eglinton; Glenn McCracken, sponsor; John Wallace, SuperValu Omagh; Paul Duffy, SuperValu Aughnacloy; Beverley Atkinson, Sharon Newell, Gary McCullough (rear) and Karen Ledgewood, JC Stewart. 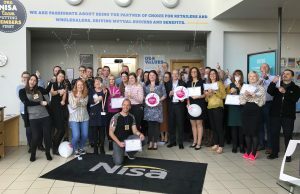 (L-R): Jessica Keown and Tanya Kinnin, Miestone Rathfriland; Jenny McQuillan and Briege Ashley, Co-Op Old Park Road; Robert Houston and Rose McDonald, Greens of Lisburn; Frank Hagan (rear), The Fiveways NisaExtra; Philip Campbell, sponsor; Lucy McCormack from the Henderson Group representing Eurospar Crossmaglen; Una Donnelly; Christine Williams and Bronagh McHugh, Donnelly’s Bakery. 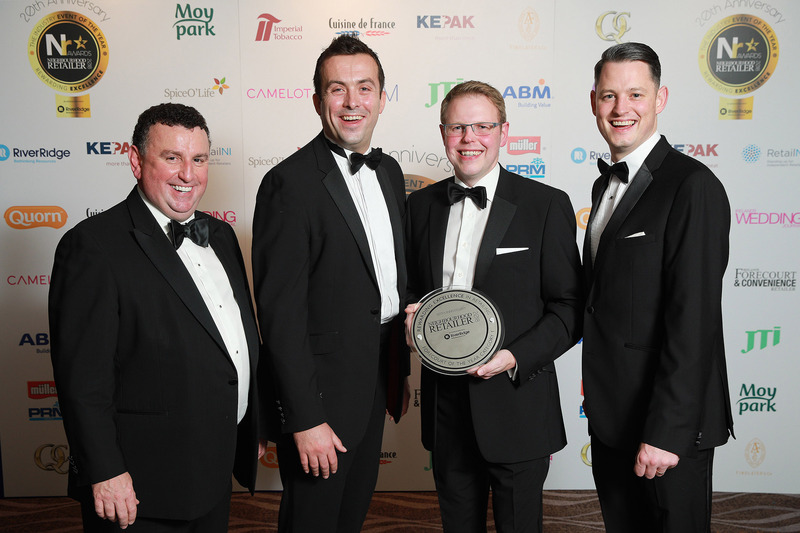 (L-R): Bill Penton, publisher of Neighbourhood Retailer; James Widdowson, from category sponsor Point Four; Mark Hammond and William Page from Applegreen M1 Southbound. 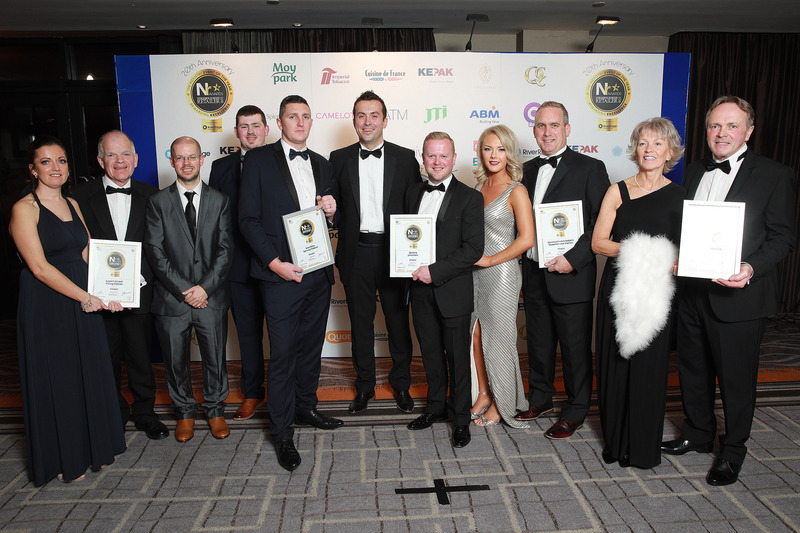 (L-R): Christina McNally, Don Woolsey and James Woolsey, Scotch Street Filling Station; Jordan Porter and Sean Flynn, Sion Mills Service Station; James Widdowson from category sponsor Point Four; Gerard Boyd and Sally Boyd, Centra Junction 1; Philip Woods, Centra Circle K Dobbin Road; Kevin and Bernadette Farrell, Derrygonnelly Spar. 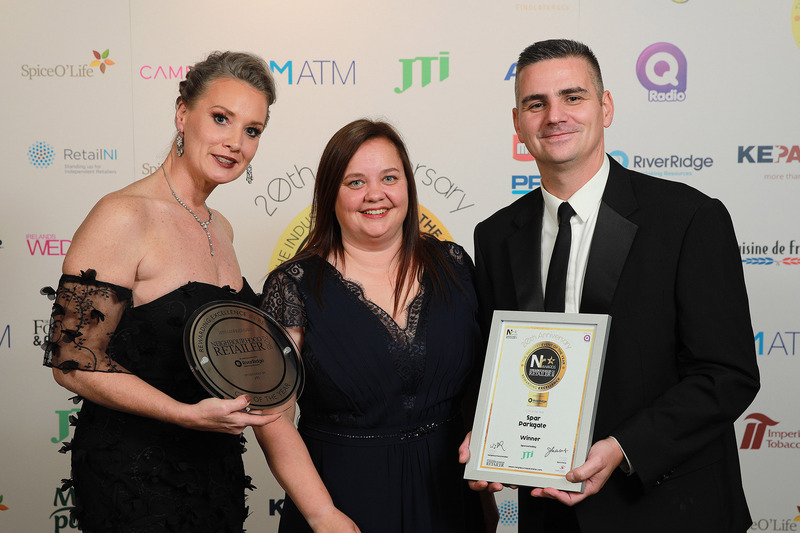 Diane and William Bill from Spar Parkgate accept CTN of the Year award from Andrea Keers (centre) of category sponsor JTI. 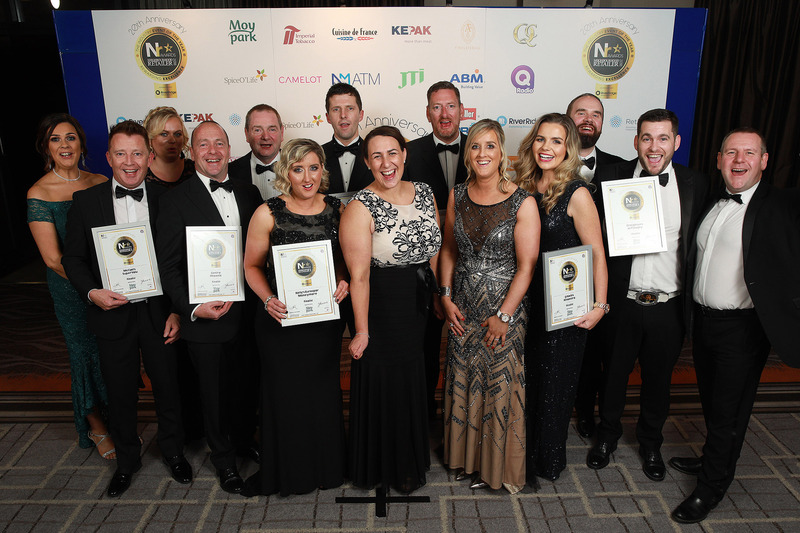 (L-R): Dale, Aaron, and Michelle Beckett, Vivo Ballyrobert; David and Wendy Cooke, Vivo Donemana; Sinead Rainey, Darren Rainey (rear) and Peter McCormick (rear), Vivo Essential Toomebridge; Andrea Keers, sponsor (front); Noel Kavanagh jnr., Centra Waterloo Place; Don Woolsey, Nathan Woolsey (rear), Pauline Woolsey, James Woolsey and Christine McNally, Scotch Street Filling Station. 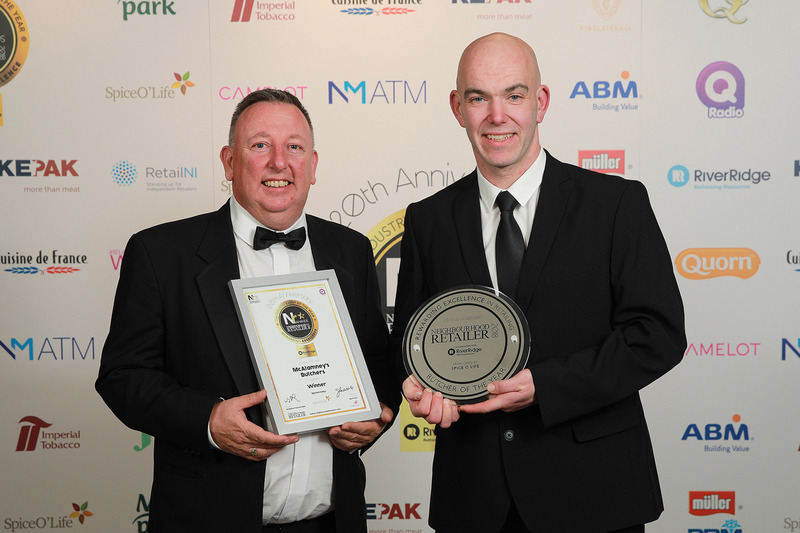 Derek O’Reilly of category sponsor O’Reilly’s Wholesale presents the award to Andrew Porter (left) and Michael Smyth (right) from Creightons of Balmoral.Derek O’Reilly of category sponsor O’Reilly’s Wholesale presents the award to Andrew Porter (left) and Michael Smyth (right) from Creightons of Balmoral. 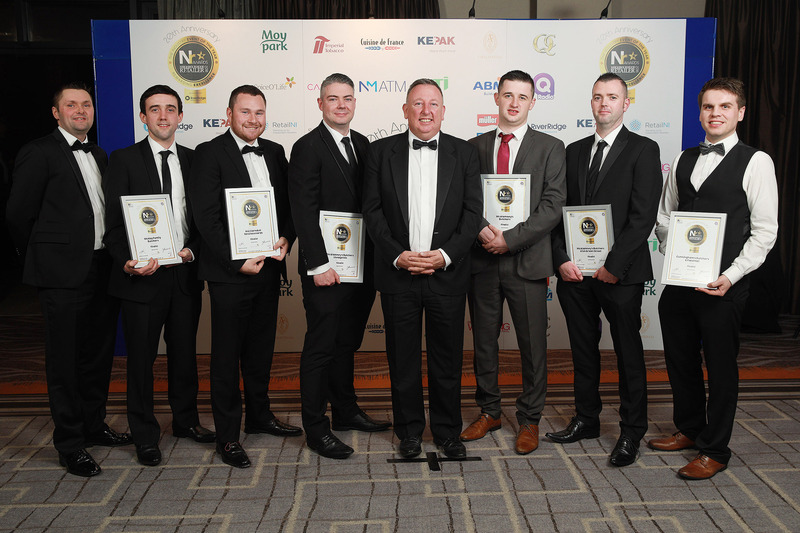 (L-R): Niall Kirkpatrick, Centra Portglenone; Jonathan McCullagh, McCullagh’s Spar; Robert Irvine (rear) on behalf of Emo Express Aldergrove; Derek O’Reilly, sponsor; Mark Hackett on behalf of Emo Express Aldergrove; Peter McCool and Kevin Killough, Centra Phoenix and Steven Wilson (rear), Ivan Wilson’s Mace. 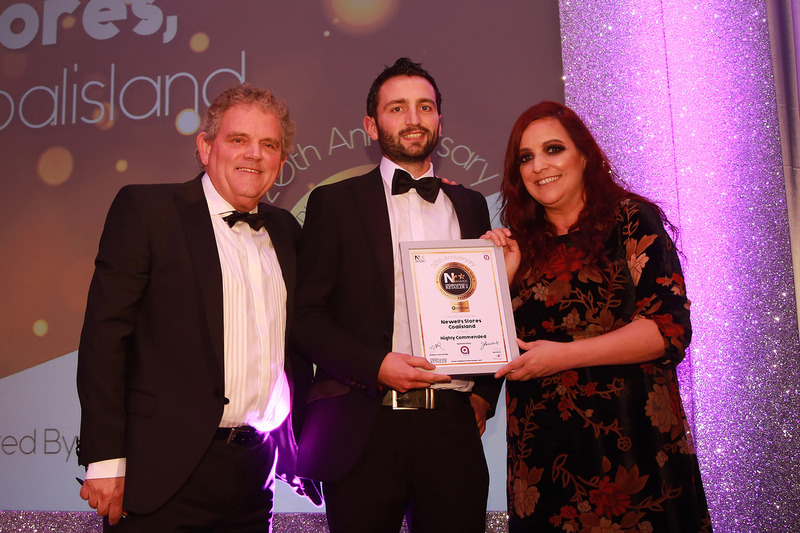 Scott McCormack, from category sponsor Findlater & Co presenting Sandra Mogey from Lusty’s Centra, Larne with the award. 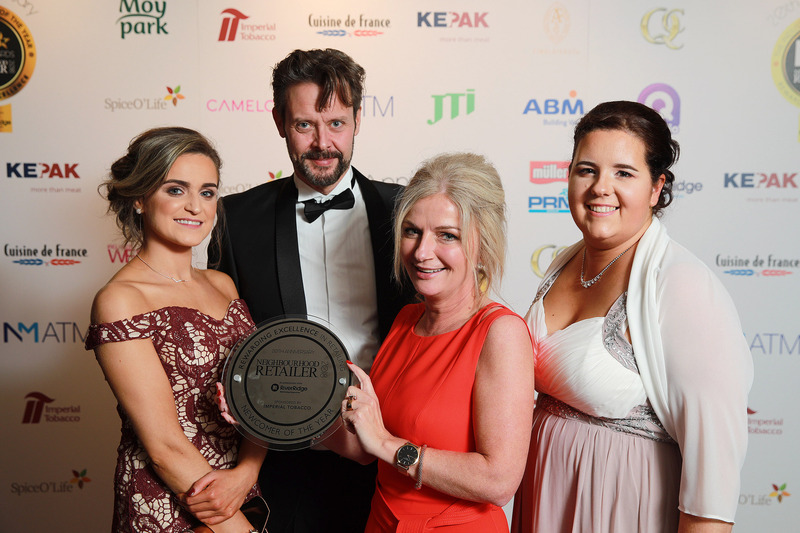 Anita and Patrick Kennedy, from Kennedy’s Pharmacy are pictured with Emma Dickson of category sponsor Ireland’s Wedding Journal (left). 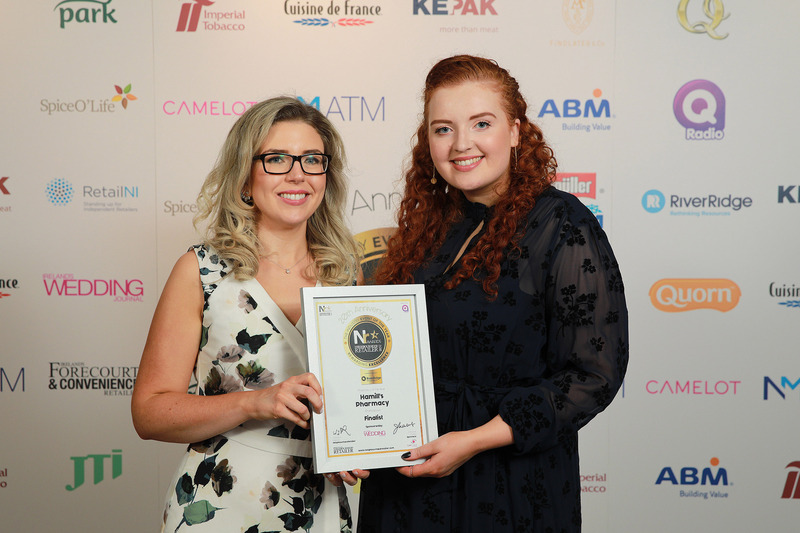 Maria Logan (left) of Hamill’s Pharmacy is pictured with Emma Dickson (right) from category sponsor. 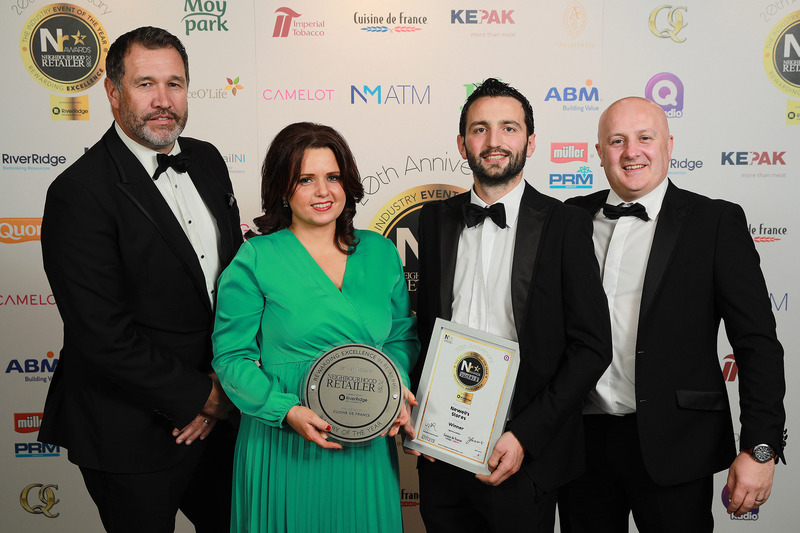 Neighbourhood Retailer’s Nicholas Avis, representing category sponsor ABM presents the Best Customer Service Awards to Josephine and George Gormley from Centra Claudy. 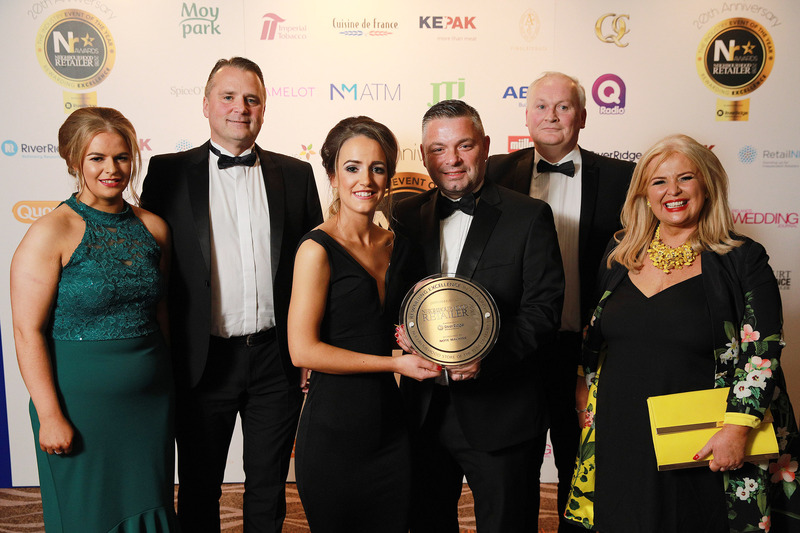 (L-R) Lexie Beatty and Chloe Haveron, Beatty Spar; Samuel Smyth, Smyth’s Eurospar; Karen McClarnon and Alan Gilliland, Creightons of Finaghy; Nicholas Avis (rear), sponsor; Eimear and Paul Moran and Moran’s SuperValu and Jonathan McCullough, McCullagh’s Spar Classic Service Station.